One of the things I was most excited about when researching cannabis products on the market was topicals. In the United States you can find all kinds of topicals from cosmetics to bath soaks. You can get them here as well but we don't have as many to choose from. This will change as time goes on and more products fill the marketplace and Weed Mama plans to review the best ones. CBD is an incredible anti-oxidant for the skin and has been revered for its ability to relieve stubborn skin conditions. I've been using the Blissed Love THC and CBD infused face cream for close to 3 weeks now with impressive results. The cream is infused with 50mg of THC and 100mg of full spectrum CBD. You can also choose to buy CBD infused without THC, I have both. I found that I only needed to use a small amount of the cream and it's deeply moisturizing. My skin hates winter, it gets tight and hurts. I normally use a very good retinol cream however even that cream couldn't beat the winter dryness. I found I'd have to continually reapply throughout the day and when you're using an expensive cream, that can add up to having to buy too much cream and spending too much money. Blissed Love's cream however was so deeply moisturizing I didn't have to reapply. The tightness was gone, this is the first cream I've ever used that's managed to beat winter dryness! The past year I've developed eczema around my eyes. It creates an unsightly red splotch under one eye and dry, itchy cracked skin by the other eye and the retinol cream did nothing to help. Once I started using Blissed Love I noticed the eczema gradually got better, it's been almost 3 weeks using the cream and the eczema is about 75% reduced. I also used this cream through a menstrual cycle and as you ladies know, that's when you get pimples like you're 14 and it can be embarrassing. I didn't get any this time, zero, zilch, none. water, stearic acid, grape seed oil, avocado oil, calendula, aloe, hydrolyzed oats, phenoxyethenol, sorbic acid, caprylic acid, citric acid, hemp oil, cedarwood, rose blossom, full spectrum CBD and THC distillate. water, stearic acid, grape seed oil, avocado oil, calendula, aloe, hydrolyzed oats, phenoxyethenol, sorbic acid, caprylic acid, citric acid, hemp oil, sandalwood, orange blossom, full spectrum CBD. The cream isn't greasy at all, it absorbs nicely and has a very light scent. I'm allergic to scented creams and this naturally scented cream was pleasant and didn't bother me at all. If you're like me and battle dry, itchy winter skin give this cream a try, they retail for $30. 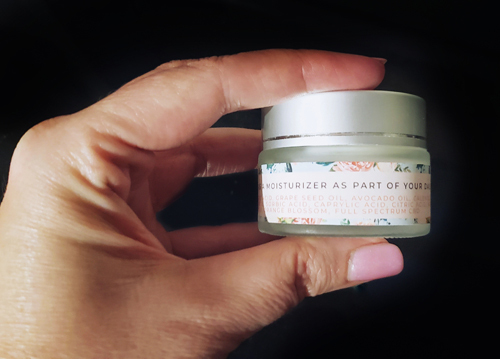 I use this cream alongside my retinol cream and find the two together to be great for my skin. 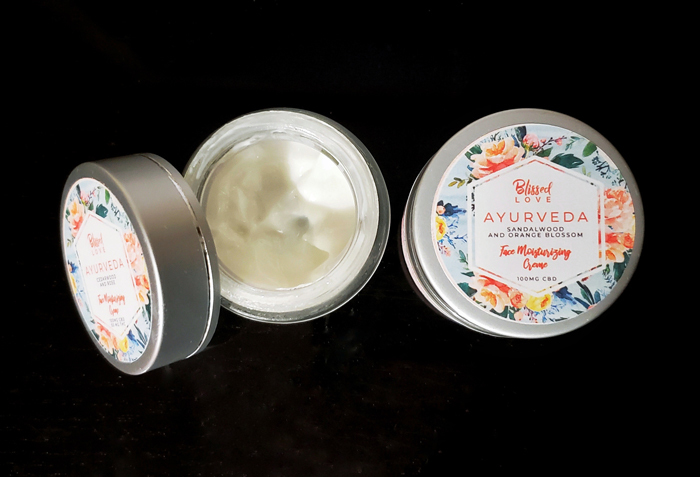 Visit Blissedlove.com to order this cream from their online store. Oh and you might want to try their bath bombs! I love their bath bombs for a long relaxing soak.